HUIXTLA, Mexico — Thousands of Honduran migrants heading to the United States -- a caravan President Donald Trump has called an "assault on our country" -- stopped to rest on Tuesday after walking for two days into Mexican territory. Sleeping on cardboard boxes or plastic bags, the migrants set up a massive, impromptu camp in the southern town of Huixtla, 70 kilometres from the Mexico-Guatemala border. Many nursed bleeding feet mangled by 10 days of walking nearly 800 kilometres in plastic shoes or flip-flops. "They’re exhausted," said migrant rights activist Rodrigo Abeja, of the group Pueblos Sin Fronteras (People Without Borders), which is accompanying the caravan. "They’re going to rest here today and tonight," and then continue their journey north, he said. 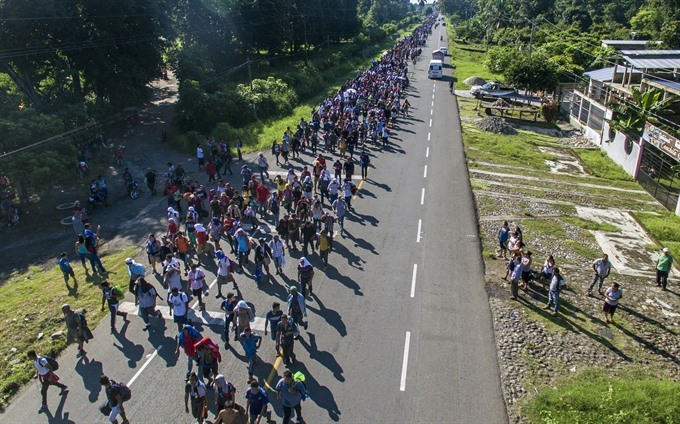 Late Monday, Mexico allowed about 400 migrants to enter the country after they spent days packed onto a bridge over the Suchiate River, which forms Mexico’s southern border with Guatemala. Humanitarian organisations estimate that one-fourth of the caravan’s members are children, a representative of Save the Children said. Guadalupe Del Carmen, 29, who is traveling with her nine-year-old son, recounted the difficulty of the journey -- such as the moment her son started to cry, "Mommy, I don’t want to do this anymore" while crossing the Suchiate River on a raft made of inner tubes. "He wanted to go back to Honduras. But I explained we can’t go back, that the situation in our country is too difficult and that’s why we had to run away," she said quietly.